The year ends and begins on an expensive note for our family. We have both our birthdays and the anniversaries, ours and our parents’ all between December and January. Over the years, we’ve combined our gifts for the occasions, but post 17 years of marriage, what do you gift the man who has everything, including the perfect wife? The answer is simple – the Amazon Fire TV Stick. I must mention that the spouse is now in a committed relationship with Amazon Prime while I Breathe easy till next December. The husband was like a kid in a candy store with a limitless credit card and hadn’t stopped binge-watching all his favourite TV shows. I, too, began to warm up to the new member of the family as I realised that Amazon Prime has a buffet of blockbuster films, Indian and Hollywood as well as popular television series across seasons. Their Amazon Originals, particularly, look promising and the curation of content goes to show their investment as an overall entertainment channel for every audience. It’s truly a refreshing change to watch shows other than the regressive Saas Bahu sagas on the GECs. Well, even as I was still picking and choosing things to watch, one fine day THIS happened! You’d understand the wild beating of my heart only if you are a 90s kid, and had this crush on Madhavan after seeing Banegi Apni Baat. Those dimples, deeper than the Indian Ocean and that impish smile got so many of us through difficult times. Uff, Maddy was the quintessential boy next door, the one that you could bare your heart and soul to and he’d still be around to catch you if you fall. Excuse my rambling, but Maddy as Ashley was perhaps the best thing to happen to us girls back then, but unlike the 90’s, I could now watch him on demand with Amazon Prime. And when he was asking me to, how could I not? Monday afternoon, I had a date with Maddy. I was introduced to a cop, Kabir Sawant, and his team. Even though his eccentricities, and his dependence on alcohol, he is shown to be shrewd enough to fit missing puzzle pieces to solve cases. And then comes Danny, the widowed father to six-year-old Josh. And even as you are taking in their happy faces, you realize that Josh, a rare AB Negative blood group, is in dire need of a lung transplant. And his father, Madhavan as Danny Mascarenhas, will stop at nothing to get him his miracle. Breathe, Amazon Prime’s latest India original weaves a gripping story across its seven-episode run leading to the climax of the 8th episode which airs next week. You are taken back and forth across a timeline that spans the lives and deaths of the various AB Negative donors interwoven with Josh’s deteriorating health that gives him six months max to live. How does an alcoholic cop whose wife is next on the donor list crack this case? How does Danny, a god fearing and loving family man, not think twice before depriving another family of a loved one? How far will you go to save the life of your offspring and how far is far enough? Well, you’ll have to watch it to find all these answers. 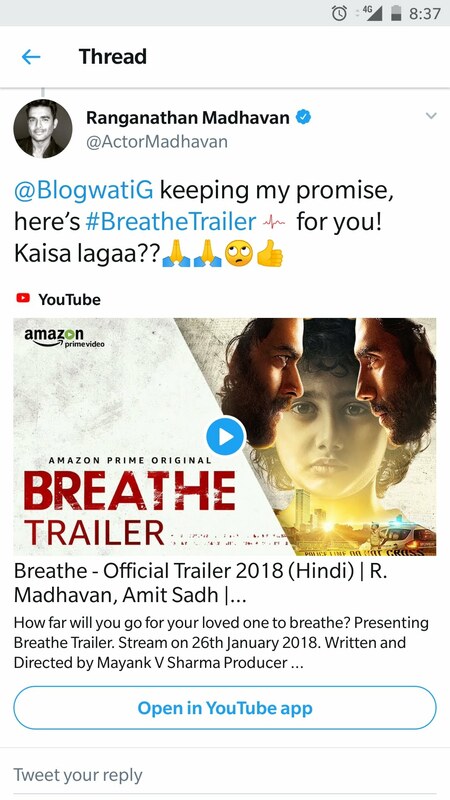 Written and directed by Mayank Sharma, Breathe, a psychological thriller promises to keep you on the edge of your seat. It throws two ordinary people with their troubled backstories in the milieu fighting against the one thing they don’t have – time. Sharma has done an excellent job of keeping the narration fluid. Introducing a story tangent and then coming back to it an episode later keeps you wanting to know more. Amit Sadh owned the screen as his brilliance shone through his eccentricities with a controlled yet power-packed performance. Maddy as the helpless father tugs at your heart even though you know he is on the other side of the law. The nuances in his character, from that of a father who explains to a guest, the importance of an appropriate birthday gift to the one who beats up a neighbour when his pleas to lower the music volume goes unheard show what he is willing to risk. Between his struggle after killing his victims and his promise to his dead wife, Danny will have you sympathizing with him all the way. Another actor who brought his character alive on-screen is Hrishikesh Joshi as Prakash Kamble the sub-inspector. His little moments added the much-needed respite from the shades of grey of the protagonist and the antagonist. At present the episode in on an interesting hook where you know the direction it is headed in, yet, you want to see how it plays out. The season finale is this Friday. Catch it if you haven’t already. Maddy’s image has always been affable and to cast him in a thriller and pull it off with him, perhaps, being the predator is mention worthy. Geared to the Millennial sensibilities, I think web content is on the brink of being redefined with Amazon Original Series. As far as Maddy is concerned, my crush on him continues even though his dimples gave Breathe a miss pretty much all through. You see, the thing is, even when he is on the other side, he makes it look like he is on yours. I am hoping to see more of him in the digital space. Breathe, now my little heart. Breathe.